This Sustainability research group aims to achieve sustainability through research, education and action. The RCE London is part this group hosted by School of Law and Social Sciences at LSBU, where the RCE London is based. 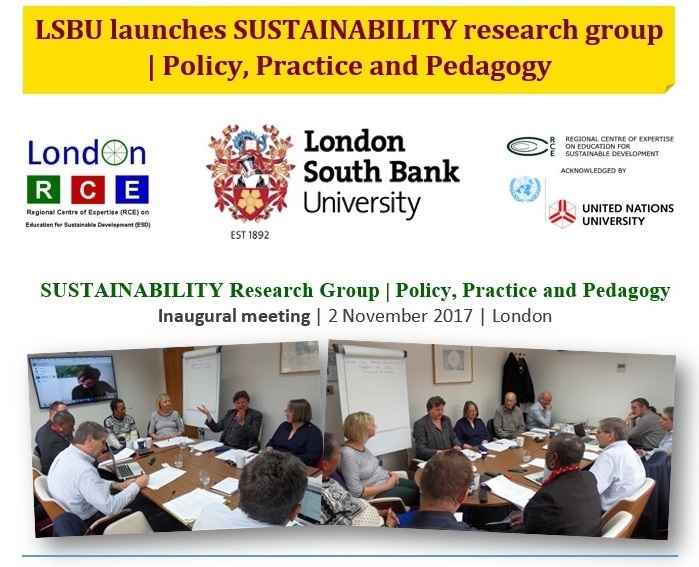 Building on the work of the London Regional Centre of Expertise (RCE) on Education for Sustainability (EfS), the group will also link with the wider global RCE network of the UN University and UNESCO networks. At this meeting, the participants developed a combined vision and sense of purpose in line with the Centre for Social Justice and Global Responsibility, developed a two-year research strategy for the group and a timetable of actions/ events for 2017-2018, and planned a publication of a journal on addressing the themes of the SDGs.